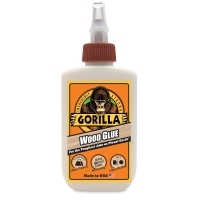 Designed "for the toughest jobs on planet Earth," Gorilla Glue products are incredibly strong. Use them for household fixes, building repairs, creative projects, and more. 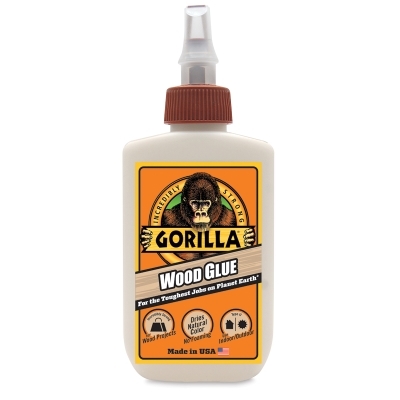 Hard-working, long-lasting Gorilla Wood Glue bonds stronger and faster for wood-to-wood applications. It's ideal for use on hardwoods, soft woods, and wood composites. Since it's water-resistant, mildew-resistant, and solvent-resistant, it's ideal for both indoor and outdoor use. The glue requires only 20 to 30 minutes of clamp time, and fully cures in 24 hours. Only natural wood fibers are used, with no added dyes, creating a natural-looking bond line that is sandable and paintable. Gorilla Wood Glue is made of a non-toxic, water-based, solvent-free polyvinyl acetate (PVA) that is approved by the FDA for indirect food contact. It passes the ANSI/HPVA Type II water-resistance test, yet cleans up easily with water. ® Gorilla is a registered trademark.™ For the Toughest Jobs on Planet Earth is a trademark.